DAYTONA BEACH, Fla. – Seven-time NASCAR champion Jimmie Johnson and veteran crew chief Chad Knaus showed one thing Sunday at Daytona International Speedway: They can be successful without each other. Knaus struck first with new driver William Byron, winning Hendrick Motorsports’ 13th Daytona 500 pole, the most of any team in NASCAR’s premier series, with a 194.305-mph lap. A few hours later, Johnson emerged victorious in the rain-shortened Advance Auto Parts Clash by escaping a multi-car crash he and Paul Menard triggered at the front of the field. It was the seventh Clash victory for Hendrick Motorsports and Johnson’s second. “It’s been a pretty awesome day,” said team owner Rick Hendrick, whose organization fielded the four fastest cars in Daytona 500 qualifying. “It’s just unbelievable to have the four cars qualify like that, and then to have Jimmie win the Clash. I think … that’s the first time he’s finished (the Clash) in seven years. 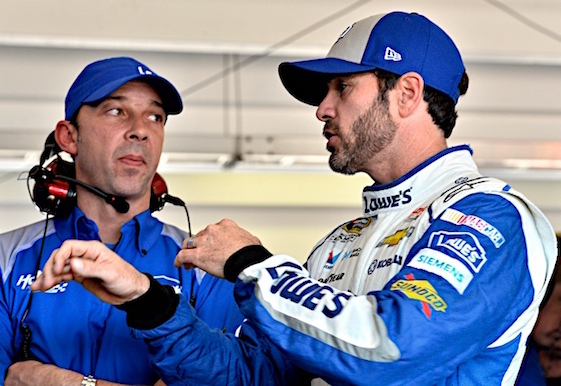 When Hendrick announced last year that after 17 years together and seven record-tying championships Knaus and Johnson would be separated, many questioned whether they would be successful without each other. Sunday’s performances answered that question. “There’s different pressures put on each team, and certainly outside pressures of … somebody came up with a great idea of who’s going to win first, Jimmie or Chad, and the pressure, can we win again,” Johnson said. “There’s just different things that any and every team and every driver deal with, so to work through today and to win today just kind of, I think, helps with some of that outside pressure on where the team is. After Byron became the fifth different Hendrick driver to earn the Daytona 500 pole in a record five straight years, Johnson congratulated Knaus. Knaus reciprocated, going to victory lane to congratulate his former driver. “A lot of you people were here back in the (No.) 24 days, in its youth and to be a part of that and be able to come back as crew chief of the 24 car and qualify first for the Daytona 500 is just an awesome dream for me,” Knaus said after claiming Chevrolet’s 700th pole in NASCAR’s premier series. Johnson said he and Knaus were developing a different type of relationship now that they’re no longer working together as driver and crew chief. Knaus’ and Byron’s pole didn’t come with the controversy that accompanied Johnson’s victory. In the rain-shortened race that was stopped twice for inclement weather, Paul Menard led 51of the 59 laps. With rain on the horizon, Johnson dove to the inside of Menard for the lead on the backstretch and side drafted him. The move turned Menard in front of the field, triggering a 17-car crash. A few minutes later rain halted the scheduled 75-lap race again, and NASCAR declared it official. During Menard’s TV interview Menard said Johnson triggered the massive crash with “aggressive side drafting” and the Hendrick driver “does that a lot at these tracks.” Johnson didn’t deny it. Kurt Busch finished second and team owner Chip Ganassi went to NASCAR officials to argue that Johnson should be disqualified for going below the double-yellow line in the incident. NASCAR disagreed and Johnson kept the victory.